Product prices and availability are accurate as of 2019-04-18 10:39:10 UTC and are subject to change. Any price and availability information displayed on http://www.amazon.com/ at the time of purchase will apply to the purchase of this product. Paleo Cooking Bootcamp for Busy People is a step-by-step meal preparation course that allows you to cook breakfast, lunch, and dinner options for an entire week in a single, highly focused two-hour power cooking session. The complete bootcamp program consists of four weekend cooking sessions (each lasting two hours), that enables you to eat delicious, paleo-approved meals for an entire month. This is a fantastic way to build momentum for a major dietary transition, or enjoy delicious meals without having to worry about preparing from scratch every time. 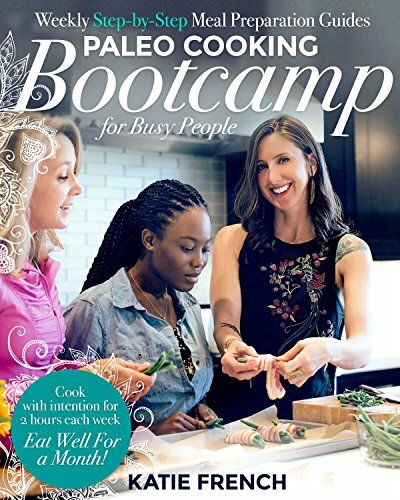 Paleo Cooking Bootcamp for Busy People is inspired by author Katie French’s live class presented in the San Francisco Bay Area, where it won the prestigious “Best of SF” designation by San Francisco magazine. With this book, you have a systematic, stress-free approach to ensure you adhere to your healthy eating goals during you and your family’s hectic weekdays. For each week’s menu, there is a grocery list, a list showing what order to cook everything (the “Cooking Order”) during your session, and recipes with step-by-step instructions and vibrant photos. Even if you are a cooking novice, you can jump right in and build the skills and efficiency to quickly increase your confidence and enjoyment with meal preparation. Anyone will admit that a two-hour time investment on the weekend is worth the bounty it delivers to ease your everyday meal preparation stress and increase adherence to healthy choices, but making it happen requires a precise, intentional approach where no time is wasted. Paleo Cooking Bootcamp for Busy People takes the guesswork out of the equation and let’s you go straight the fun stuff in the kitchen!